No metal can ever be as dynamic as gold. It adorns the pride of Indian beauties in the form of jewellery as well as supports economy as bullion. For hundreds and thousands of years, people have been awestruck by furniture and pillars of kings encased in gold. This traditionally Indian symbol of luxury is going to get a much-needed operational boost with the 10th Gujarat Gold Jewellery Show (GGJS) 2019 at Ahmedabad on 4-6 January. For retailers seeking new designs to manufacturers showing trend-defining inventory, GGJS has a goodwill for supporting only those worthy of modernizing and expanding the sector outreach. The Retail Jeweller gets in touch with several key retailers who have been participating in the jewellery show and appreciate how it has evolved with time. With the elaborate display of countless designs, many retailers felt spoilt for choice regarding what to buy and what to keep for the next visit. “There is a wide range of jewellery on display. It is certainly the very best jewellery from the Gujarat region as well as other national hubs like Mumbai and Chennai as well,” said Pankaj Chopra of A.T. Plus Jewellers, Gondia. For others wanting to leverage the sheer volume of jewellery turn out Gujarat can make, GGJS has been a regular show marked on their calendars. Also, there is a lot of diversity in design trends each of the jewellery hubs Rajkot, Surat and Baroda bring out. It is no wonder that this state has been providing options for bulk buy and curated purchase alike. Rajesh Vummidi of VBC Jewellery Chennai praises the variety of products at GGJS. “This show is an excellent example of a compact, boutique show which brings forth the very best of regional craftsmanship and talent. My experience of GGJS has always been very comfortable and convenient. It showcases the very best jewellery from cities like Surat, Baroda and Rajkot. I do a lot of sourcing from the antique and kundan segments from here,” said Sunil Verma of Kuldip Sons, Jamshedpur. “Gujarat is the Mecca of the jewellery business today and this show is very ideally located right at the heart of it. Ahmedabad and Rajkot have emerged as hubs for gold jewellery whereas Surat is where all the diamond business is. Hence, GGJS is where the jewellers get the very best of what is manufactured at these hubs of India,” maintained Anil Talwar of Talwarsons. Kanigulla Apparao of Vaibhav Empire, Vishakhapatnam has also been satisfied with his visits to GGJS as he was able to introduce the best of Gujarat’s jewellery to his region and impress customers. Gujarat’s culture is ancient yet modern. The manufacturing hubs being Junagadh, Rajkot, Ahmedabad and Surat, the state is a master of antique, jadau and plain gold jewellery. 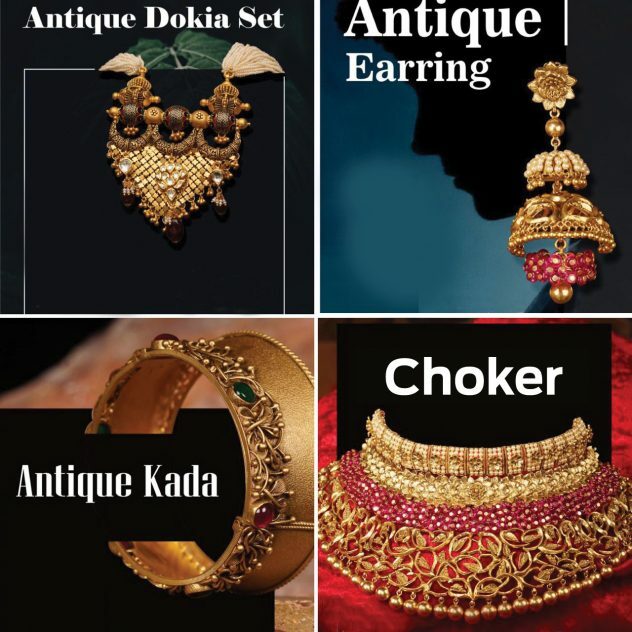 As Rajkot makes machine-made products in bulk, Ahmedabad specialises in handmade antique jewellery while dia and bilandi jewels are popular in Surat and Junagadh respectively. Vertical malas and CNC jewellery of Rajkot are famous. The place also has a lot more manufacturers than anywhere else in the state, says Hitesh Soni of Lakhtarwala Jewellers. The city also has the most advanced technology for producing machine-made jewellery which are bigger as compared to the small items of Ahmedabad, says Vineet Vasa of Lotus Jewellery Creation. “The yield of jewellery is such that without Gujarat’s inputs, stocks across India will be incomplete,” says Jaydeep Vadher, RK Silver and Gold. South India has been a consistent customer of Gujarati pieces, feels Akshaybhai Mehta of Bhakti Gems & Jewellery. “Hyderabad, Bengaluru and Chennai continue to buy bulk jewellery from us,” he says while Dhruv Shah of Satva Gold has witnessed a spurt in demand of jadau and marwad sets from Rajasthan. An initiative of the GGJS and Gold Ornaments Wholesale Jewellers Association (GOWJA), GGJS is the only Indian jewellery show focusing on gold. While handicraft is one of the specialties of the state, Gujarat is also an international trendsetter in traditional kundan and jadau works. From 45 booths in 2010 to 700 in 2019, GGJS has grown to become one of the largest business-to-business gold shows of the industry. GOWJA has partnered with the GGJS throughout and is the strongest and largest association in Gujarat of the jewellery industry. The show, to be held at the 1.7 million sqft wide Gujarat University Convention Centre in Ahmedabad, is slated to draw 30,000-plus trade visitors from around the world. GGJS has been increasing their visitor profiles with every passing show and working holistically to include the lengths and breadths of the industry with remote yet excellent manufacturers. It has become a hunt for the very best of jewellery and has become one of the most sought after B2B meets in the country. “Attending GGJS definitely helps one gauge the pulse of the market and learn about the latest trends. This region has evolved into one of the biggest markets for the jewellery industry and does a significant amount of purchasing from here for my business. I am certainly looking forward to the next edition of GGJS,” said Saurabh Gadgil of PN Gadgil & Company, Pune. With technology and communication having advanced exponentially, it is very tough to safeguard a design trait of a particular company from being copied by competitors. Copied jewellery creates confusion among end consumers and erodes credibility of the original brand in the market. But this is something GGJS has never entertained. “These days there is a lot of copied jewellery that is available in the market. But when you visit shows like GGJS, you realize what the actual difference between the copied and original pieces is. You get to experience and learn how to appreciate true quality,” says Anil Talwar of Talwarsons Jewellers, Chandigarh. Besides jewellery trade, ancillary industries providing logistical services and consultancy also find equal representation in GGJS. This platform also helps build trustworthy business relations and networking, as manufacturers and retailers discuss their plans f or the coming commercial year and even have representatives of ancillary industries bring their plans to fruition. The goal to grow more is achieved regularly with due attention to a hassle-free buying experience, professionalism and an unflinching focus on quality. To ensure that, the GGJS 2019 has promised a knowledge forum to its manufacturers and retailers on popular demand from international jewelers expressing interest in the show. An excelling platform requires on-ground responses from its collaborators to stay steady on its growth curve. Similarly, few retailers feel that the already dynamic group of jewelers the show promises should be expanded further to represent new designs, regions and fashion senses. “It just requires some more innovation and newer, fresher manufacturers to present their products, so that the range and variety of the show is always maintained,” says Ashok Soni of Manik Chand & Jewels India Pvt. Ltd, Guwahati. Rishi Kumar Baid of Jewel India Jewellers, Kolkata seconds Soni. “From a buyer’s perspective, I would like GGJS to bring forth the very best of the regional jewellery industry. The big players go to all the bigger shows and already get a lot of exposure. We do often end up meeting the same big manufacturers in most events in the major cities. I would like GGJS to give preference to smaller manufactures, to introduce new sellers consistently to the show, those who might have the potential and skill but do not have that level of exposure as the regulars at the bigger shows held in the metropolises get,” he maintains. Everyone starts from scratch, and an unorganized small sector was the foundation for Gujarat’s jewellery, said Hiren Kotak of Kotak Enterprises. Over a decade, the state adopted an organised format with help from German manufacturing companies. “Handmade jewellery consisted 100% of the produce back then,” said Chetan Satikunvar of JP Exports. But over the years, immigration of skilled craftsmen from Kolkata, Jaipur etc improved labour quality in the state. “GGJS, since its inception has been raising jewellery demand from the state by helping with production technologies and good designs,” said Choksi, adding that factors like cost-competitiveness and formation of more jewellery parks would be growth drivers of the sector in the long run. “We are working hard to make customers flock to Ahmedabad instead of Mumbai for buying jewellery and are confident about our progress,” maintained Satikunvar.